TVPast Forums | How to Re-Encode Videos Using Hybrid? I took several screenshots. This is a quickie mini-guide for you. a. Source is x264 (or x265, you were not sure), in a Matroska (MKV) container. 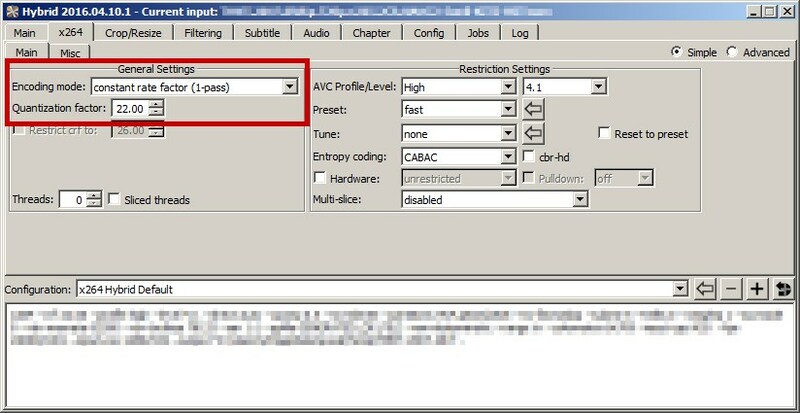 You can save as an MP4, MKV, etc .... name the new file as the desired format, and Hybrid will auto mux as needed. Since Hybrid is queue-based, even for a single encode, this means you can batch many jobs. You wanted audio, so include it. 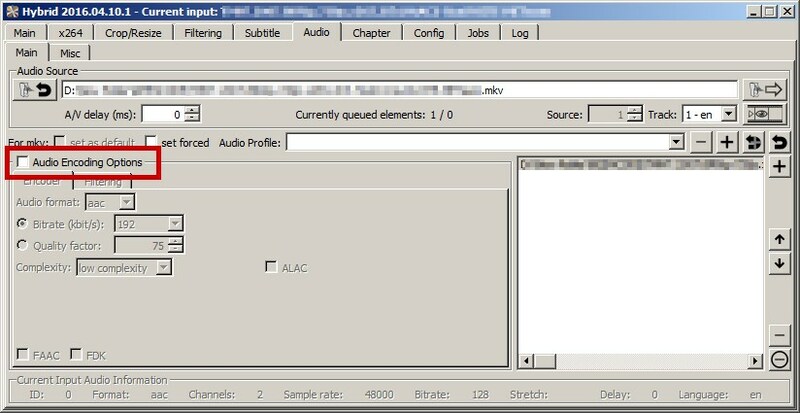 Auto-add first audio stream to the new file. I assume 1 stream, or a main stream with useless streams afterwards (foreign language, commentary). Removing needless streams reduces file size. This will also save you later muxing in MkvToolNix. Video handling is your target encode; x264 in your case (not next-gen HEVC aka x265). What you knew about bitrates in MPEG doesn't really translate to next-gen encoding -- less so when transcoding (converting). For this sort of task, use CRF (constant rate factor), with a quantize rate of anywhere from 16 to 25. And 16 is low compression, while 25 is high compression. 16-19 is for noisy or busy source, 20-22 is for average source, and 23-25 is for really clean source or cel animation. This gets more complicated, but for a newbie, it's a good intro. For you, start with 22. See how it looks. 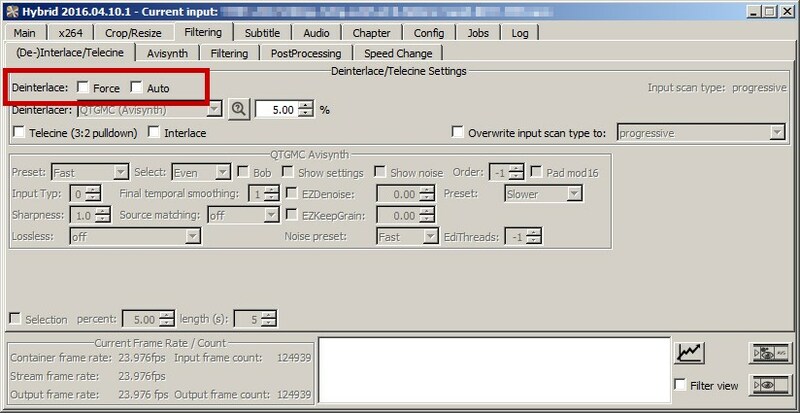 By default, re-encoding is turned on. Turn it off, since you want to keep your original audio stream. However, I often re-encode to AAC at 200-300 bitrates (192, 224, 256), as it can sound just as good. My TV is stereo, not a wall rumbler attached to every wall in the room. I'm a TV fan, not a movie fan, and almost no TV show has surround sound. The nature of x/H.264 encoding is that softeners are applied, rather than artifacts, when bitrate gets low. Most 1080p encodes are therefore about 720p in quality, when not fed huge bitrates on the huge Blu-ray discs. The lower you drop resolution, the more file sizes shrinks. I never bother to encode non-disc content above 720p (or 1280 max width). I never go lower than 640x360, preferring everything in the 720x404/406 to 1280x720ish range. On a large 55" HDTV, sitting 10 feet away, it looks great. Size your encodes sensibly. 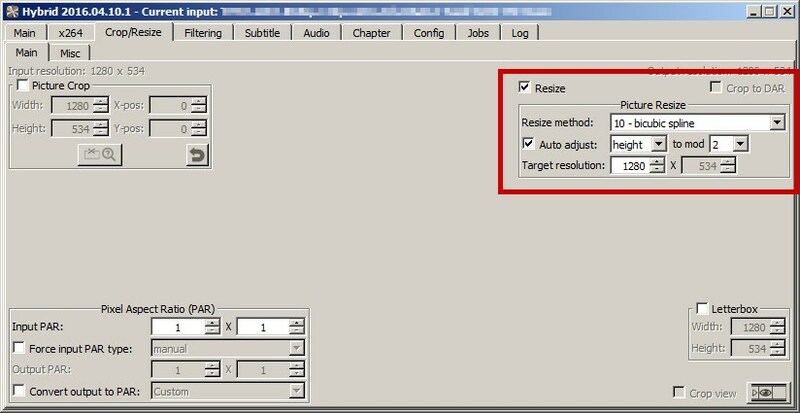 To maintain aspect ratio, auto-adjust the size (assuming source was correct aspect). In this example, the source was slimmer than 16x9, and the black bars in a 16x9 matte were removed for encoding on the source. So the actual size is 1280 (720p) by 534 (instead of 720). And there you go. Enjoy the mini guide. Use the same version, not the newest one. Maybe something changed. But I doubt any changes were so profound as to be impossible to locate. I cannot look into it right now. You should have posted a screenshot if you see something different, don't make me guess.